Billions of Twitter posts will no longer fade into obscurity now that Google is indexing them all in a massive, searchable database. Google announced a new search feature that lets users look at an entire history of tweets on any subject, in any time frame. The feature will roll out over the next couple of days, but you can see it in action now through a special link (ironically, it didn't work for me in Chrome, but Firefox was fine). By entering a search term and selecting "Updates" under search options, you can quickly find tweets on that term dating back to February 2010. 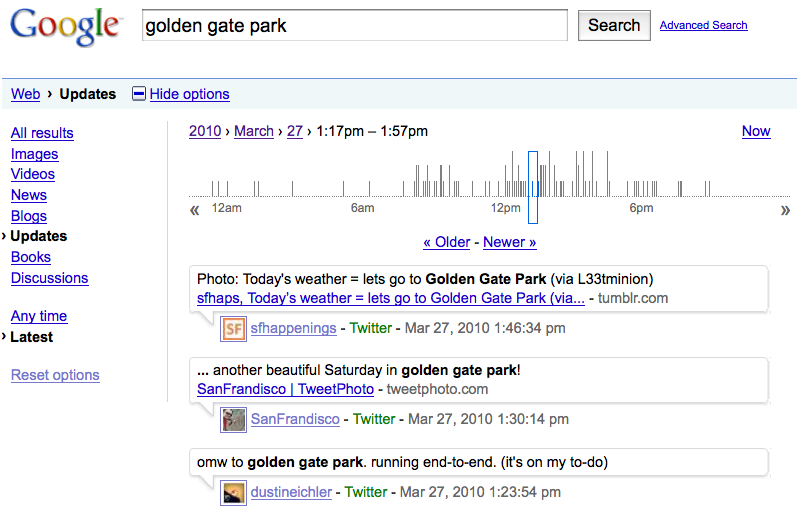 Google says you'll soon be able to go all the way back to the first Tweet on March 21, 2006. Twitter status updates never really disappeared with time, they were just difficult to search. Results on Twitter's Web site are displayed chronologically, so going back in time required patience and lots of clicks on the "more" button. Google only showed recent status updates as well. With Google's new Twitter search feature, you can view all Tweets within a specific day, month or year, using a graph that appears on top of the results. 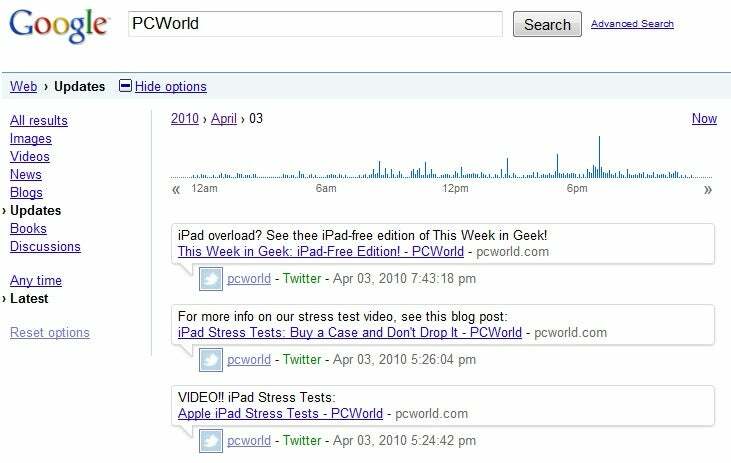 For example, it's possible to see what PCWorld Tweeted on April 3, 2010, iPad launch day. As explained on the Official Google Blog, the feature's actually pretty handy if you want to see what people where saying on the day of a major event, such as Congress' passing of health care legislation. But as I alluded to in the headline, it also makes it easy for people to look at anything you wrote during a specific date or time period, as long as your timeline is public. That is, of course, the nature of Twitter, whose greatest asset is that it's out in the open. But if you have a habit pronouncing your seedier weekend exploits to the world, understand your entire history will soon be up for examination.